The carryover 2019 Honda CR-V is available, and its deals roll unchanged into April. Though the 2019 CR-V is a carryover, there may be a CR-V Hybrid arriving sometime in the 2019 model year. There is no official word from Honda on this, so don't hold your breath for it. Demand for the CR-V has been high, driving up prices, but there are some deals to help buyers out. There may also be some deals coming around Memorial Day to soften up pricing. Offers listed here are available nationally and expire April 30, 2019. Honda hasn't released any cash incentives on the 2019 CR-V yet. Honda generally offers at least a small dealer cash incentive on the CR-V, so keep an eye out for this to return in the coming months. The 2019 CR-V 2.4 LX runs $249 per month for 36 months with $2,399 due at signing. With a $316 effective monthly cost, this is not a good value relative to its $25,395 MSRP. All-wheel drive costs an extra $10 per month and $200 at signing. Qualified buyers can get the 2019 CR-V with 1.9 percent APR for 36 months or 2.9 percent for 60 months. Promotional APR Offer Promotional APR programs available for qualified buyers. Please check with your CarsDirect Trusted Dealer for complete details.%NotesManuf% %Eligibility% Residents residing in qualifying regions of the United States. O.A.C. %Qualification% All eligible vehicles must be new and unregistered. Dealers are not eligible for Dealer mark-ups. EligibilityResidents residing in qualifying regions of the United States. O.A.C. Being a leader for numerous years in a segment is a tough thing to pull off, but the Honda CR-V continues to be the benchmark in the heavily contested compact crossover arena. Despite facing more competition than ever, the CR-V continues to come out on top thanks to a spacious cabin, good safety features, and punchy yet fuel-efficient powertrains. The 2019 Honda CR-V ticks all of the right boxes, which is what makes it such a well-rounded option. There are no changes for the 2019 Honda CR-V. The CR-V has two engines to choose from. The base CR-V comes with a 2.4-liter four-cylinder engine that produces 184 horsepower and 180 pound-feet of torque. Those seeking more power can opt for a turbocharged 1.5-liter four-cylinder that's rated to make 190 hp and 179 lb-ft of torque. Front-wheel drive is standard, while all-wheel drive is also offered for an extra $1,400. A continuously variable transmission (CVT) is the sole gearbox offered on the CR-V. Surprisingly, fuel economy is better for the turbocharged engine. The standard 2.4-liter engine is rated to get an EPA-estimated 26 miles per gallon city, 32 mpg highway, and 28 combined; all-wheel drive lowers these figures by one mpg in each category. The turbocharged 1.5-liter is capable of getting up to 28/34/30 mpg (city/highway/combined). Once again, AWD knocks one mpg off each. Despite being a compact crossover, the CR-V has a useful amount of cargo space. 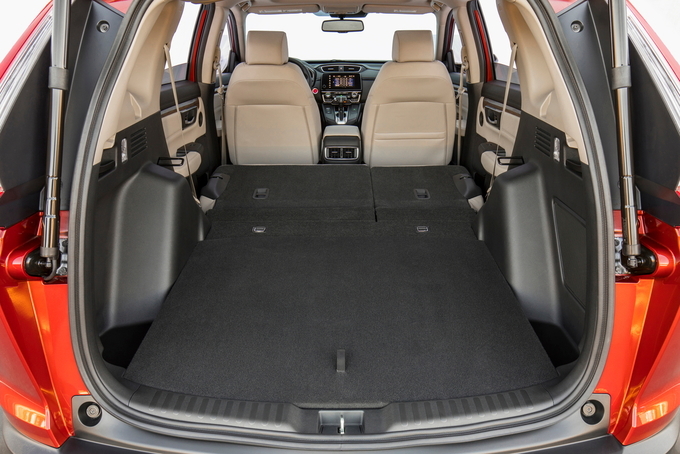 With the rear seats in place, the CR-V has 39.2 cubic feet of cargo space. Folding the rear seats down opens cargo space up to 75.8 cubes. 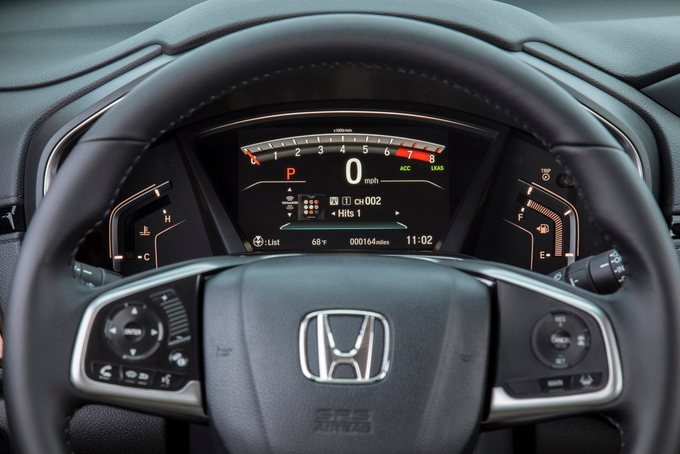 Every trim except for the entry-level LX comes with Honda Sensing, which is the automaker's suite of advanced safety tech. Honda Sensing includes collision mitigation braking, road departure mitigation, adaptive cruise control, and lane keeping assist. There are no option packages available across the lineup. The entry-level LX starts at $25,395 (all prices include the $1,045 destination charge). Standard exterior features include 17-inch wheels, remote keyless entry, a roofline spoiler, and LED daytime running lights. On the inside, the LX comes with automatic climate control, a tilt-and-telescopic steering column, a six-way manually adjustable driver's seat, a four-speaker audio system, a five-inch LCD screen, a multi-angle rearview camera, Bluetooth, a USB port, and two 12-volt power outlets. Pricing for the EX trim starts at $28,295. The EX adds the turbocharged 1.5-liter four-cylinder engine, 18-inch alloy wheels, remote engine start, Honda Sensing, automatic headlights with auto high-beam, blind-spot monitoring, rear cross-traffic alert, smart entry with Walk Away Auto Lock, push-button start, a moonroof, heated side mirrors, dual-zone automatic climate control, heated front seats, a 12-way power adjustable driver's seat, a seven-inch touchscreen, HondaLink, Apple CarPlay and Android Auto, and SiriusXM. The EX-L is priced at $30,795 and brings a power tailgate with programmable height, a leather-wrapped steering wheel, an auto-dimming rearview mirror, a universal garage door opener, a driver's seat with two-position memory, leather upholstery, and a four-way power adjustable passenger seat. The range-topping Touring trim costs $33,795. Standard features over lower trims include rain-sensing windshield wipers, a hands-free access power tailgate, roof rails, LED headlights, dual chrome exhaust finishers, a nine-speaker audio system, and navigation. Having the latest safety features in a vehicle is crucial, which is what makes the 2019 Honda CR-V EX so attractive. It's affordable, comes with the peppier and more fuel-efficient turbocharged engine, Honda Sensing, and a bunch of comfort features as standard. The addition of Apple CarPlay and Android Auto as standard on the EX also solidifies the trim as the best starting point for the majority of drivers. Do-it-all crossover for the masses. 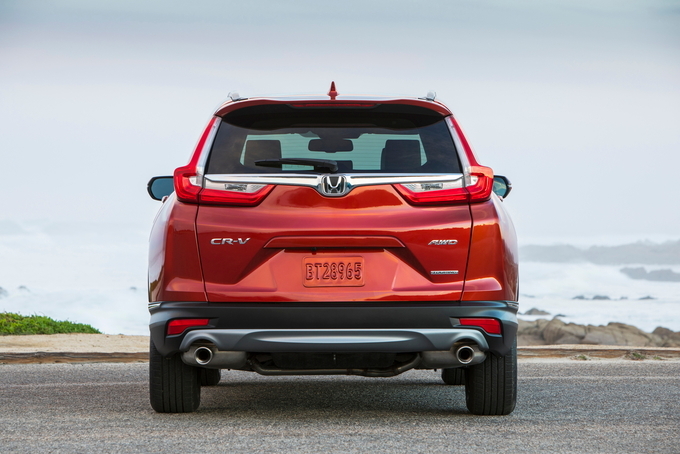 Following its 2017 redesign, the Honda CR-V carried on basically unchanged in 2018 and 2019. 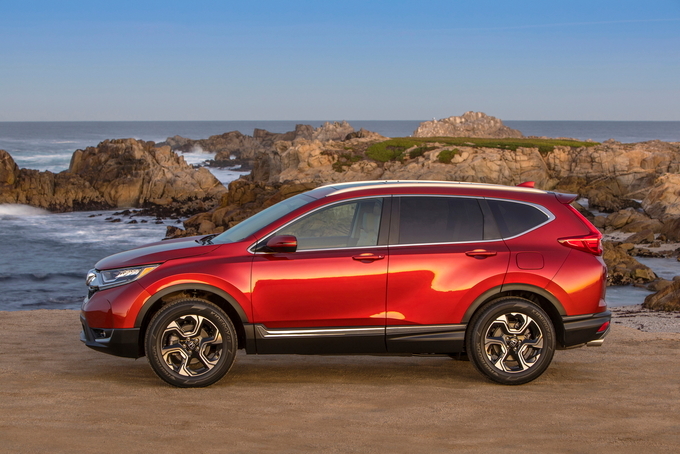 The 2019 Honda CR-V is a do-it-all crossover that casts a wide net to pull in as many buyers as possible by combining a roomy passenger area, massive cargo area, loads of optional tech, and plenty of advanced safety equipment. The only limitation to its draw is its odd styling that may scare away some buyers. Looks aside, the CR-V is a crossover aimed squarely at the masses. Seriously roomy cabin. 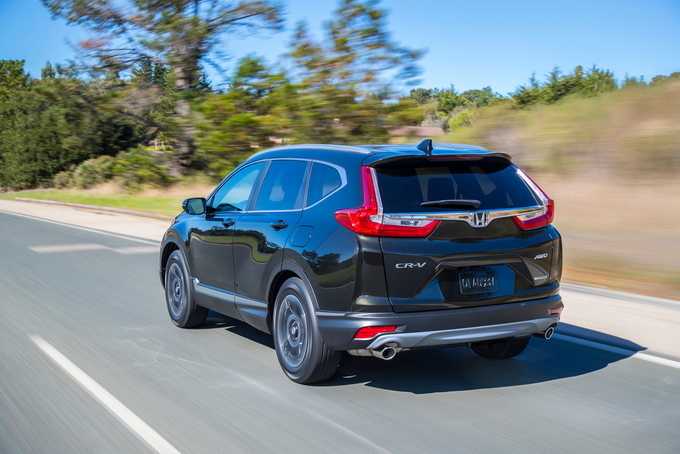 Crossovers like the Honda CR-V must hit the sweet spot between SUV and sedan by delivering great driveability and plenty of room. 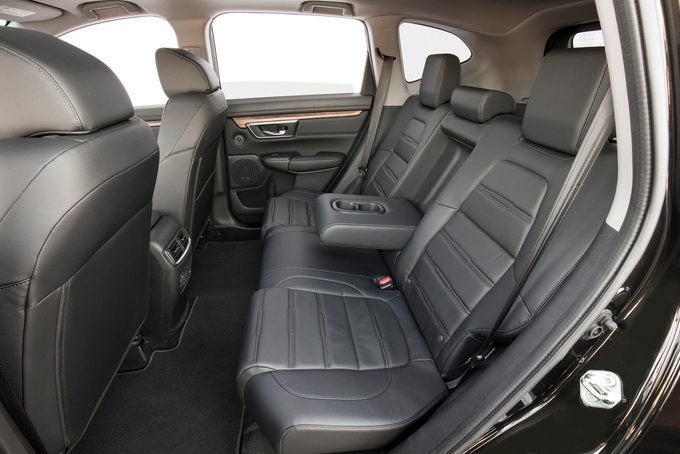 The latter is no issue in the CR-V with its rear seat offering up to 40.4 inches of leg room. Its competitors cannot match up, as the Mazda CX-5 only offers 39.6 inches, the Kia Sportage 38.2 inches, and the Ford Escape 37.3 inches. 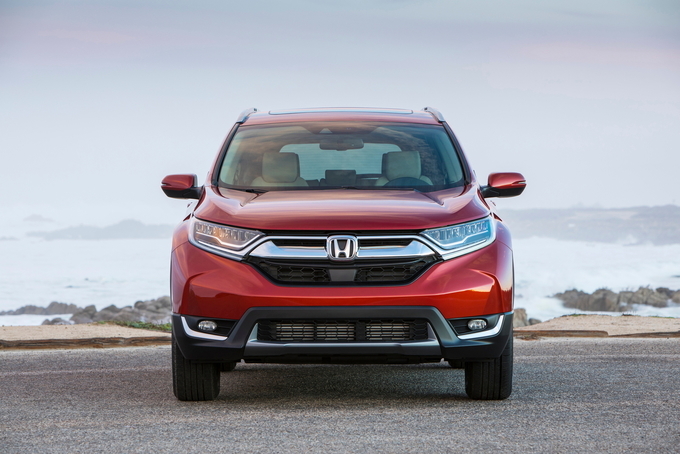 Passengers aren’t all that rides comfortably in the CR-V. Cargo also gets first-class treatment with up to 39.2 cubic feet with the seats in place and 75.8 cubes with the rear seats lowered. The competition can’t even get close to the CR-V’s cargo space, with the CX-5 offering just 30.9 cubic feet with the seats upright and 59.6 cubes with the seats folded. The Sportage and Escape aren’t much better at 30.7 cubes with the seats up and 60.1 cubic feet with the seats folded, and 34 cubic feet with the seats upright and 68 cubes with them folded, respectively. Plenty of great options. The CR-V has tons of options at fair prices, building plenty of value for customers looking for more upscale and tech-heavy features. Moving into the $28,295 (destination fees included) EX trim, which is just the second level, adds a seven-inch touchscreen, Apple CarPlay, Android Auto, 18-inch wheels, a moonroof, and more. That said, its base LX trim lacks many of the features younger buyers desire. Its features include a five-inch touchscreen, power windows, power locks, and alloy wheels. A big draw for the younger crowd is Apple CarPlay or Android Auto, and they're not even an option in the base trim. The Sportage offers these cellphone integrations as a package on its base trim, while the Toyota RAV4, Chevrolet Equinox, and GMC Terrain offer them standard. Safe and comfortable cabin. While rear-seat roominess is one thing, the rest of the CR-V’s cabin finishes the job of creating one of the most comfortable spaces in the segment. Up front, the seats are in the perfect position for great outward visibility, and thin A-pillars enhance this. These seats also have plenty of support and padding for the long haul. Being comfortable is one thing, but being safe is a whole different story. 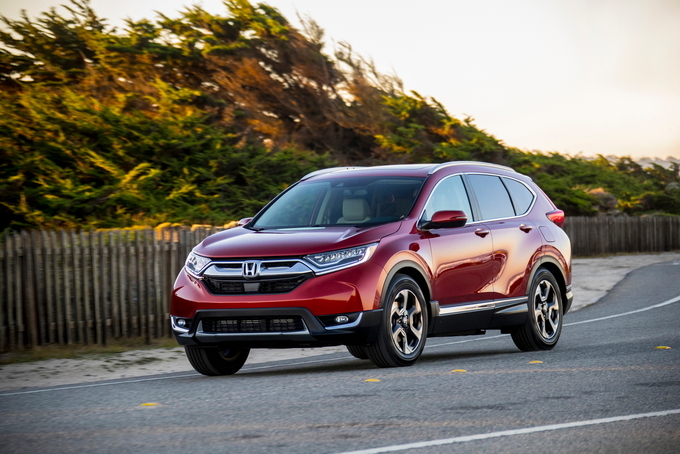 The CR-V delivers here too with its Top Safety Pick rating from the IIHS. It received “Good” crash test scores across the board and a “Superior” rating in front-crash prevention thanks to its standard automatic emergency braking in EX and higher trims. The only thing keeping it from Top Safety Pick Plus territory is a “Marginal” rating in the headlight test. Final thoughts. The 2019 Honda CR-V is the perfect crossover for buyers who want to get a vehicle as close to a sedan as possible without actually buying a low-riding one. Plus, the added versatility inside minimizes the compromises buyers must make when deciding between a crossover and a larger SUV. The CR-V isn't for everyone, though. Those looking for something that can tackle heavier off-road driving will prefer the Subaru Forester or the RAV4 Adventure. Want maximum fuel economy? Look to the Kia Niro Hybrid or the upcoming RAV4 Hybrid. And buyers looking for more pep will find what they need from 2.0-liter turbocharged engines in the Sportage and Escape.